Trading Card Central covers sports cards, non-sports cards and collectibles and features the latest industry news, articles, product reviews, forums, giveaways and a growing number of collector resources. The TCC Member of the Month Award recognizes collectors for their contribution to TCC and the hobby in general. The member chosen as the 2011 January Member of The Month is Osmond (sportscollectoroz)! The Collector Zone is a free community for trading card collectors - both sports and non-sports. There are forums for all of the major sports, non-sports, autographs and other hobby-related information. In addition, there are areas to trade, buy and sell with other collectors. Our members have now completed 49537 collector-to-collector transactions using our easy-to-use Transaction Manager. With 30904 collectors and 2821396 posts in 314291 topics, there's plenty of ways to get involved with the other members - either in discussions or with trading. In fact, there are 142 guests and members currently active in the Collector Zone. So, are you ready to join and start meeting these and other collectors? Then, simply click here to sign up for the Collector Zone. News and Announcements: September 2017 Member of the Month! Trading Card Central is pleased to announce a new partnership with Sportlots.com! As part of this partnership, TCC will become their exclusive partner in the area of trading card information and forums. 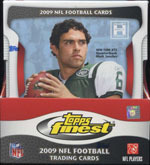 Sportlots.com is an online marketplace that sells trading cards using both a fixed-price and auction format. Over 500 dealers have listed more than 10 million cards that can be easily searched by set, favorite player or favorite team. Plus, Sportlots rewards buyers with bonus points for every purchase that can be redeemed for free cards. Click here to learn more about this exciting new partnership - including a special, limited-time promotion for TCC Collector Zone members. For the past decade, Donruss Limited Football (formerly Donruss/Leaf Limited) has become one of most popular football releases of the season. Since 2003, Limited football has changed set configuration five times and has provided the collector between 1 to 4 autographs or memorabilia cards per box depending on the year of release. In 2007, collectors were excited to learn that the Limited release would include 3 autographs or memorabilia per pack (7 cards total) and quickly became an early favorite for product of the year. 2009 Donruss Limited Football has returned to the 1 pack- 3 autographs or memorabilia format which was such a huge success just 2 years ago. When Topps Finest first hit the market in the mid 1990�s, collectors (including myself) were immediately drawn to the glossy/refractor look of the product. I can remember single packs containing 4 cards costing upwards of $10-12 a piece. From 1994-1996 Finest was considered the �high-end� product in the sports card industry and provided collectors with an innovative and sleek new alternative design compared to other competitors. 7/19/06 - The Greatest Card Ever Produced?